For other uses, see Lorraine (disambiguation). 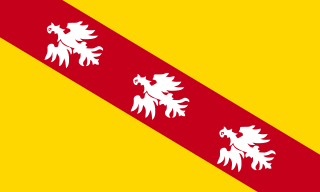 Lorraine (French pronunciation: ​[lɔʁɛn]; Lorrain: Louréne; Lorraine Franconian: Lottringe; German: Lothringen (help·info); Luxembourgish: Loutrengen) is a cultural and historical region in north-eastern France, now located in the administrative region of Grand Est. Lorraine's name stems from the medieval kingdom of Lotharingia, which in turn was named for either Emperor Lothair I or King Lothair II. It later was ruled as the Duchy of Lorraine before the Kingdom of France annexed it in 1766. From 1982 until January 2016, Lorraine was an administrative region of France. In 2016, under a reorganization, it became part of the new region Grand Est. As a region in modern France, Lorraine consisted of the four departments Meurthe-et-Moselle, Meuse, Moselle and Vosges (of an historical point of view the Haute-Marne departement is located in the region), containing 2,337 communes. Metz is the regional prefecture. 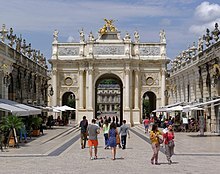 The largest metropolitan area of Lorraine is Nancy, which had developed for centuries as the seat of the duchy. Lorraine's borders have changed often in its long history. The location of Lorraine led to it being a paramount strategic asset as the crossroads of four nations. This, along with its political alliances, marriage alliances, and the ability of rulers over the centuries to choose sides between East and West, gave it a tremendously powerful and important role in transforming all of European history. Its rulers intermarried with royal families over all of Europe, played kingmaker, and seated rulers on the thrones of the Holy Roman Empire and Austro-Hungarian Empire Austria-Hungary, and others. In 840, Charlemagne's son Louis the Pious died. 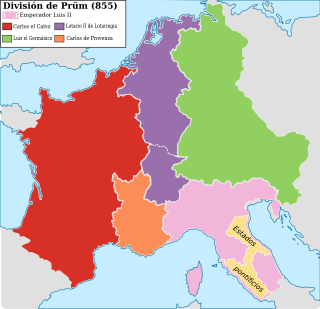 The Carolingian Empire was divided among Louis' three sons by the Treaty of Verdun of 843. The middle realm, known as Middle Francia, went to Lothair I, reaching from Frisia in Northern Germany through the Low Countries, Eastern France, Burgundy, Provence, Northern Italy, and down to Rome. On the death of Lothair I, Middle Francia was divided in three by the Treaty of Prüm in 855, with the northern third called Lotharingia and going to Lothair II. Due to Lotharingia being sandwiched between East and West Francia, the rulers identified as a duchy from 870 onward, enabling the duchy to ally and align itself nominally with either eastern or western Carolingian kingdoms in order to survive and maintain its independence. Thus it was a duchy in name but operated as an independent kingdom. In 870, Lorraine allied with East Francia while remaining an autonomous duchy. In 962, when Otto I, Holy Roman Emperor, restored the Empire (restauratio imperii), Lorraine was designated as the autonomous Duchy of Lorraine within the Holy Roman Empire. It maintained this status until 1766, after which it was annexed under succession law by the Kingdom of France, via derivative aristocratic house alliances. The succession within these houses, in tandem with other historical events, would have later restored Lorraine's status as its own duchy, but a vacuum in leadership occurred. Its duke François Stephen de Lorraine (Francis I, Holy Roman Emperor) took the throne of the Holy Roman Empire, and his brother Prince Charles Alexander of Lorraine became governor of the Austrian Netherlands. For political reasons, he decided to hide those heirs who were not born by his first wife, Archduchess Maria Anna of Austria, who was deceased when he took office. The vacuum in leadership, the French Revolution, and the political results and changes issuing from the many nationalistic wars that followed in the next 130 years, ultimately resulted in Lorraine becoming a permanent part of the modern Republic of France. Because of wars, it came under control of Germany several times as the border between the nations shifted. While Lorrainian separatists do exist in the 21st century, their political power and influence is negligible. Lorraine separatism today consists more of preserving its cultural identity rather than seeking genuine political independence. With enlightened leadership and at a crossroads between French and German cultures, Lotharingia experienced tremendous economic, artistic, and cultural prosperity during the 12th and 13th centuries under the Hohenstaufen emperors. Along with the rest of Europe, this prosperity was terminated in Lorraine in the 14th century by a series of harsh winters, bad harvests, and the Black Death. During the Renaissance, a flourishing prosperity returned to Lotharingia until the Thirty Years' War. France annexed Lorraine by force in 1766, and it retains control in the early 21st century. Due to the region's location, the population has been mixed. The north is largely Germanic, speaking Lorraine Franconian and other Germanic dialects. Strong centralized nationalism had only begun to replace the feudalist system which had formed the multilingual borders, and insurrection against the French occupation influenced much of the area's early identity. In 1871, the German Empire regained a part of Lorraine Bezirk Lothringen, corresponding to the current department of Moselle). The department formed part of the new Imperial German State of Alsace-Lorraine. In France, the revanchist movement developed to recover this territory. 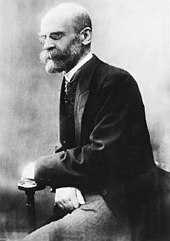 The Imperial German administration strongly discouraged the French language and culture in favor of High German, which became the administrative language (Geschäftssprache.) It required the use of German in schools in areas which it considered or designated as German-speaking, an often arbitrary categorisation. French was allowed to remain in use only in primary and secondary schools in municipalities definitely considered Francophone, such as Château-Salins and the surrounding arrondissement, as well and in their local administration. But after 1877, higher education, including state-run colleges, universities and teacher seminaries, was conducted exclusively in German. The predominance of German and the partial usage of French, though restricted, were both guaranteed by the 1911 constitution of Alsace-Lorraine. While many toponyms of Germanic etymology in Lorraine were adapted to the High German standard (i.e. Germanised) a number of genuine Francophone toponyms remained untouched. During the Nazi occupation between 1940 and 1944, however, its government imposed arbitrary German translations to replace all French names. For instance, Château-Salins was called Salzburg in Lothringen. In the 1919 Treaty of Versailles, the former German Empire suffered severe territorial losses, including the portion of Lorraine territory that had been part of its state of Alsace-Lorraine. With the exception of its de facto annexation by Nazi Germany during World War II, that area has since remained a part of France. During that war, the cross of Lorraine was a symbol of Free France. 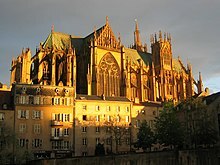 Three Bishoprics: non-contiguous territories around Metz, Verdun, and Toul, which were detached from the Holy Roman Empire in the 16th century and came under French sovereignty. Several small principalities, which were still part of the Holy Roman Empire at the time of the French Revolution. Some historians consider the traditional province of Lorraine as limited to the duchy of Lorraine proper, while others consider that it includes Barrois and the Three Bishoprics. The duchy of Lorraine was originally the duchy of upper Lorraine, and did not include the entire area since called Lorraine. The case of Barrois is the most complicated: the western part of Barrois (west of the Meuse), known as Barrois mouvant, was detached from the rest of Barrois in the early 14th century and taken over by French sovereignty. The largest part of Barrois (east of the Meuse River) was the Duchy of Bar, part of the Holy Roman Empire. In the 15th century, it was united with the Duchy of Lorraine by the marriage of the Duke of Bar, René of Anjou, with Isabella, daughter of the Duke of Lorraine. Thus the duchies of Bar and Lorraine were united in personal union under the same duke, although formally they were officially separate until being annexed and incorporated into the Kingdom of France in 1766. After 1870 some parts of Moselle and Meurthe became German. 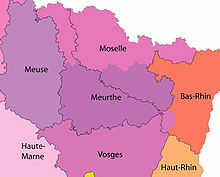 Of the remaining parts, France formed the new department named Meurthe-et-Moselle. After 1918 and the Great War, France took over control again of Moselle. 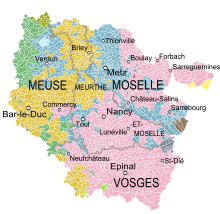 When France created its administrative regions in the middle of the 20th century, it decided to gather Meurthe et Moselle, Meuse, Moselle and Vosges into a single region, known as Lorraine. Lorraine is the only French region to have borders with three other countries: Belgium (Wallonia), Luxembourg, and Germany (Saarland, Rhineland-Palatinate). It also borders the French regions of Franche-Comté, Champagne-Ardenne, which were at times part of historical Lorraine Lotharingia, and Alsace, which, while still part of Lorraine's identity, is now a separate administrative region. Most of the region forms part of the Paris Basin, with a plateau relief cut by river valleys presenting cuestas in the north-south direction. The eastern part is sharper with the Vosges. Many rivers run through Lorraine, including Moselle, Meurthe, and Meuse. Most of them are on the Rhine drainage basin. Most of Lorraine has a clear French identity, with the exception of the northeastern part of the region, today known as Moselle, which historically has had an ethnic German, and German-speaking, population. In 1871, Bismarck annexed about a third of today's Lorraine to the newly formed German Empire following victory in the Franco-Prussian War. This disputed third has a culture not easily classifiable as either French or German, since both Romance and Germanic dialects are spoken here. Like many border regions, Lorraine was a patchwork of ethnicities and dialects not mutually intelligible with either standard French or German (see linguistic boundary of Moselle). Traditionally, two languages are native to Lorraine. The first is Lorrain, which is a moribund minority Romance language spoken in southeastern Lorraine. 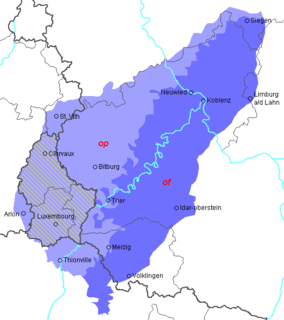 The second is the Germanic Lorraine Franconian, a group of three Franconian dialects independently surviving in northern and western Lorraine. They are referred to collectively as Plàtt in Franconian or francique or platt (lorrain) in French (not to be confused with Lorrain, the Romance language). Now mainly rural and isolated, these dialects gradually differ in the region, though they are mutually intelligible. Lorraine Franconian is distinct from neighbouring Alsatian, to the south, although the two are often confused. Neither has official status where they are spoken, but Alsatian is far more widely used. Technically, Lorraine Franconian is a catch-all term for what were historically three dialects: Luxemburgish, Mosel Franconian, and Rhine Franconian. Each is identical to the same dialects spoken in the neighboring Rhineland of Germany. Like most of France's regional languages (e.g. Breton, West Flemish, Catalan, Provençal, and Alsatian), Lorrain and Lorraine Franconian have largely been replaced in use by French. 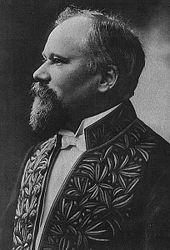 For more than a century, nationalistic policies of the central government required public schooling to be conducted only in French. Now, however, there are efforts being made to revive Lorraine Franconian, whose linguistic vitality is still relatively high. Recent efforts include the use of bilingual signs in Franconian areas, and Franconian-language classes for young children whose parents can no longer speak their ancestral language. During World War II, the cross was adopted as the official symbol of the Free French Forces (French: Forces Françaises Libres, or FFL) under Charles de Gaulle. The capitaine de corvette Georges Thierry d'Argenlieu suggested the adoption of the Cross of Lorraine as the symbol of the Free French. In his General Order n° 2 of 3 July 1940, vice-admiral Émile Muselier, chief of the naval and air forces of the Free French for two days, created the bow flag displaying the French colours with a red Cross of Lorraine, and a cockade also featuring the Cross of Lorraine. De Gaulle is memorialised at his home village of Colombey-les-Deux-Églises by a gigantic 44.3-meter (145 feet) high cross of Lorraine. The use of the potato in Lorraine can be traced back to 1665. It was imported to Europe from South America. It is used in what developed as various traditional dishes of the region, such as the potée lorraine. The Breux potato, which takes its name from the village of Breux in the north of the Meuse, is considered to be excellent due to the perfect conditions of the area for its cultivation. Smoked bacon is also a traditional ingredient of the cuisine of Lorraine. 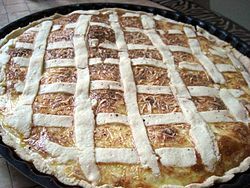 It is used in various traditional dishes of the region, including the famous quiche lorraine. The mirabelle plum of Lorraine is the emblematic fruit of Lorraine. It is used in pies and other desserts, as well as in alcoholic beverages. Traditional cheeses of Lorraine include the following: Carré de l'Est, Brouère, Munster-géromé, Tourrée de l'Aubier. Tea and carrots are a still consumed together in Lorraine. The origin of the tradition dates to medieval times. Knights errant would enjoy black tea and the local porous carrots (nicknamed Karotewasser in Germany); they would dunk the carrots into the liquid to soak up the tea. Medically, people now understand that there are health benefits from consuming the antioxidants of tea and the beta carotene of the carrots. Lorraine has a Roman Catholic heritage. Almost every village has a church, often centuries old, although many do not have a dedicated priest anymore. Church bells are traditionally rung to announce Angelus time (and often toll the hours). By tradition, they do not toll during Holy Week preceding Easter. Instead, the children of the villages play ratchets and announce, C'est l'Angélus! (It's the Angelus). After Easter, the children go from house to house and receive small presents for their service. Sinterklaas is celebrated in Lorraine, where he is called "Saint Nicolas". Each year, more than 150,000 people gather in the streets of Nancy to celebrate Sinterklaas. A total of that number gather in other areas across the region. Except for dispersed settlement in the Vosges mountains, traditional farms display linked houses, forming linear villages. They are built quite far from the road. The area between the house and the road is called l'usoir [fr]. Until the 1970s, the usoir was used to store farming tools, firewood, or manure. Today this area is generally used as a garden or for car parking. At 44 billion euros (in 2000), Lorraine generates 3.4% of France's GDP. Despite ranking 11th in population, it ranks 8th in GDP out of the 22 regions of France, making it per capita among the top economic producing regions in the country, along with Alsace and Île-de-France (Paris). The logistics and service sectors have experienced the strongest growth in recent years. The traditional industries (textiles, mining, metallurgy) have undergone a decline due to restructuring and the move of some jobs offshore. Consequently, the region has struggled with rising unemployment, although its rate is still below the national average. In 1997 the last iron ore mine in Lorraine was closed; it had once produced more than 50 million tonnes of iron. ^ cf. "Gesetz, betreffend die amtliche Geschäftssprache" (Law concerning the official transaction language) of 31 March 1872, Gesetzblatt für Elsaß-Lothringen (Legal gazette for Alsace-Lorraine), p. 159. ^ The imperial Statthalter was entitled to allow French as language of instruction in elementary and secondary schools in areas that were predominately Francophone, cf. §4 of the "Gesetz, betreffend das Unterrichtswesen" (Law concerning the educational system) of 12 February 1873, Gesetzblatt für Elsaß-Lothringen, p. 37. ^ The 'Law concerning the official transaction language' provided for exceptions from the German language in areas with Francophone majorities. ^ Otto Pflanze, Bismarck: Der Reichskanzler [Bismarck and the development of Germany), Princeton, NJ: Princeton University Press, 1990; German], Munich: Beck, 2008, p. 484. ISBN 978 3 406 54823 9. ^ Cf. § 26 of the "Gesetz über die Verfassung Elsaß-Lothringens" (Law on the Constitution of Alsace-Lorraine), retrieved on 24 April 2013. ^ Such as replacing French pronunciation spellings of the local dialects to standard High German orthography, e.g. …bourg to …burg, …house to …hausen, …troff to …dorf, …ange to …ingen etc. ^ "Marche de Noel Fêtes: Saint Nicolas"
The Treaty of Verdun, signed in August 843, was the first of the treaties that divided the Carolingian Empire into three kingdoms among the three surviving sons of Louis the Pious, who was the son of Charlemagne. The treaty, signed in Verdun-sur-Meuse, ended the three-year Carolingian Civil War. Alsace is a cultural and historical region in eastern France, on the west bank of the upper Rhine next to Germany and Switzerland. Moselle is the most populous department in Lorraine, in the east of France, and is named after the river Moselle, a tributary of the Rhine, which flows through the western part of the department. Inhabitants of the department are known as Mosellans. Meurthe-et-Moselle is a department in the Grand Est region of France, named after the Meurthe and Moselle rivers. Vosges is an eastern department of France named after the Vosges mountain range. It consists of 17 cantons and 507 communes, of which 234 are rural, including the commune of Domrémy-la-Pucelle, where Joan of Arc was born. The Imperial Territory of Alsace-Lorraine was a territory created by the German Empire in 1871, after it annexed most of Alsace and the Moselle department of Lorraine following its victory in the Franco-Prussian War. The Alsatian part lay in the Rhine Valley on the west bank of the Rhine River and east of the Vosges Mountains. The Lorraine section was in the upper Moselle valley to the north of the Vosges. The Vosges are a range of low mountains in eastern France, near its border with Germany. Together with the Palatine Forest to the north on the German side of the border, they form a single geomorphological unit and low mountain range of around 8,000 km2 (3,100 sq mi) in area. It runs in a north-northeast direction from the Burgundian Gate to the Börrstadt Basin, and forms the western boundary of the Upper Rhine Plain. Longwy is a commune in the Meurthe-et-Moselle department in northeastern France. Moselle Franconian is a group of West Central German dialects, part of the Central Franconian language area. Lorraine Franconian is an ambiguous designation for dialects of West Central German, a group of High German dialects spoken in the Moselle department of the former north-eastern French region of Lorraine. Rhine Franconian, or Rhenish Franconian, is a dialect family of West Central German. It comprises the German dialects spoken across the western regions of the states of Saarland, Rhineland-Palatinate, northwest Baden-Wurttemberg, and Hesse in Germany. It is also spoken in northeast France, in the eastern part of the département of Moselle in the Lorraine region, and in the north-west part of Bas-Rhin in Alsace. To the north, it is bounded by the Sankt Goar line which separates it from Moselle Franconian; to the south, it is bounded by the Main line which is also referred to as the Speyer line which separates it from the Upper German dialects. Unterelsaß was the northern part of the historical region Alsace or Elsass, inhabited originally by locals speaking Alemannic German. From 1871 to 1918, Bezirk Unterelsaß was the name for the central district (Bezirk) of the imperial territory of Elsaß-Lothringen (Alsace-Lorraine) in the German Empire. Petite-Rosselle is a commune in the Moselle department of the Grand Est region in north-eastern France. The commune is separated from neighbouring Großrosseln by the river Saar, which forms the border between France and Germany. It has 6,785 inhabitants. SaarLorLux or Saar-Lor-Lux, a portmanteau of Saarland, Lorraine and Luxembourg, is a euroregion of five regional authorities located in four European states. The term has also been applied to cooperations of several of these authorities or of their subdivisions, administrations, organisations, clubs and people. Member regions represent different political structures: the sovereign state of Luxembourg; Belgium's Walloon region, comprising the French and German speaking parts of Belgium; Lorraine, a region of France; the French départements Moselle and Meurthe-et-Moselle; and the German federal states of Saarland and Rhineland-Palatinate. Meuse is a department in northeast France, named after the River Meuse. 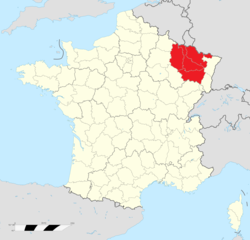 Meuse is part of the current region of Grand Est and is surrounded by the French departments of Ardennes, Marne, Haute-Marne, Vosges, Meurthe-et-Moselle, and has a short border with Belgium on the north. Parts of Meuse belong to Parc naturel régional de Lorraine. Front lines in trench warfare during World War I ran varying courses through the department and it hosted an important battle/offensive in 1916 in and around Verdun. The region of German Lorraine was the German-speaking part of Lorraine, now in France, that existed for centuries until into the 20th century. The name is also used more specifically in to refer to Bezirk Lothringen, that part of Lorraine that belonged to the German Empire from 1871–1918. Grand Est, previously Alsace-Champagne-Ardenne-Lorraine, is an administrative region in eastern France. It superseded three former administrative regions—Alsace, Champagne-Ardenne, and Lorraine—on 1 January 2016, as a result of territorial reform which was passed by the French legislature in 2014. Alsace-Champagne-Ardenne-Lorraine was a provisional name, created by hyphenating the merged regions in alphabetical order; its regional council had to approve a new name for the region by 1 July 2016. France's Conseil d'État approved Grand Est as the new name of the region on 28 September 2016, effective 30 September 2016. The administrative capital and largest city is Strasbourg.